Shouty RGB lighting and aggressive red and black paints jobs can be a lot of fun, especially when you’re a teenager or someone who thinks putting lots of Xs in their gamertag makes them seem edgy. But at some point, it’s time to grow up. Now that doesn’t mean you need to cut out video games completely, don’t be silly. After all, everyone is a gamer now, with people ages 36 and up representing 45 percent of the total US gamer population. Instead, maybe just consider buying gaming gear that doesn’t look like you’re hosting a one person rave every time you turn it on. 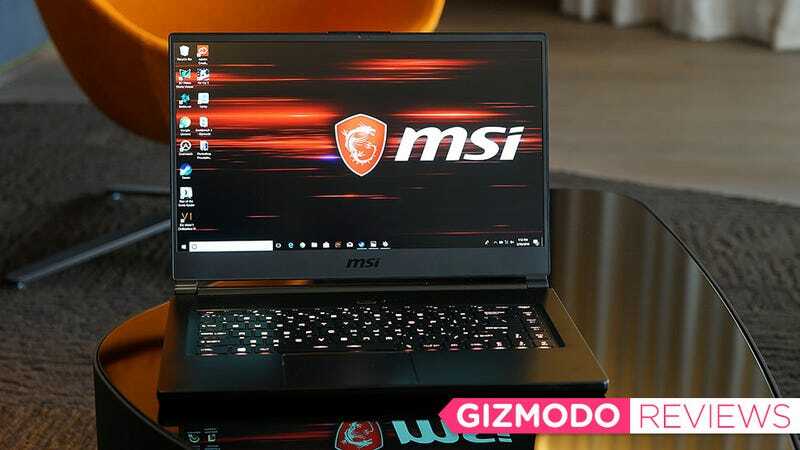 That’s why when MSI got around to redesigning its thin-and-light 15-inch gaming machine, the company rethought its approach and this time, opted to make its GS65 a more mature kind of gaming laptop. And then, almost as if to make you feel better about choosing something less flashy, the company went and made sure it was powerful too, by equipping it with one of Intel’s brand new six-core Coffee Lake CPUs. 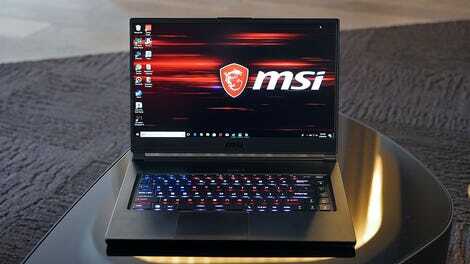 Unlike MSI’s previous-gen GS systems, gone are the company’s usual ostentatious light-up badge and shiny crimson accents. Instead, there’s just a simple dragon logo painted on the lid complemented by additional flashes of gold around the touchpad, inside the vents, and elsewhere. It’s a look that invokes the kind of confidence you get from wearing a nice suit, rather than a chain wallet or a jacket with too many zippers. Even the keyboard’s lighting is understated. By default, it’s set to cast a pale champagne glow, something that wouldn’t draw weird looks from your boss if you opened it up during a meeting. But after the day is done and you want to get some gaming in, the GS65 still has a full compliment of RGB backlights thanks to MSI’s partnership with SteelSeries, so you can turn on the fireworks (if you want). It’s clean here, but the GS65's matte finish is also a fingerprint magnet. On top of that, the GS65 is sleeker too, with slimmer bezels around the display and losing almost a full inch in length versus last year’s model. It’s not a huge improvement, but when you combine all these little space savings with a new power brick that’s almost half the size, you’re left with a system that you might actually consider using as your everyday workhorse. And as you’d expect from MSI, this thing has a plethora of ports ranging from USB-C with Thunderbolt 3, to HDMI, Ethernet and mini DisplayPort, and separate mic in and audio out jacks too. The splash of gold inside the GS65's vents is a nice touch. However, MSI’s chase for lightness isn’t entirely without drawbacks. Across a number of spots, like on the grille surrounding the power button, the lid and even the keyboard itself, there’s a little too much flex in the aluminum for my liking. While the flexing didn’t cause any issues directly, I’m worried that one day its going to bend too much, and it might not bend back. I’d feel a lot better about the GS65's long-term durability if its hinge felt more substantial. But my greatest area of concern is the laptop’s hinge, which is the only major part of the laptop made out of plastic. When carrying it around closed, holding by the hinge like a big paperback book , it produces tiny little groans and creaks that don’t inspire a ton of confidence, though to MSI’s credit, nothing actually broke or went wrong. Finally, there’s the GS65's one-piece touchpad. It’s pretty big, and has a lot of room to work with, but it often felt a bit stiff or numb when clicking. It’s another minor issue, but I still wish it felt more responsive. However, if you can get past that small set of quirks, you’ll be rewarded with some impressive performance. Thanks to the new six-core Intel i7-8750H CPU that came in our review unit, the GS65’s score of 18,031 in Geekbench 4 was more than 40 percent better than the 12,850 I got from the GS63 I reviewed last year. That’s some pretty serious gains. And when it comes to games, frame rates in Rise of the Tomb Raider jumped by more than 15 percent, from 80.68 fps to 93.9 fps on high settings, despite both new and old systems having the same GPU and amount of RAM. At heart, the GS65 is still a gaming machine, so you can still do stupid stuff like make the keyboard light up like an American flag. But we’re not done yet, because instead of reaching for a sky-high 4K resolution, the GS65 keeps things more civil at full HD, before adding a 144Hz refresh rate to make things spicy. That means if you don’t mind turning down graphics quality, you can boost fps even higher and get a small competitive advantage in shooters like CS:G or Overwatch over younglings who just want to crank the sliders to 11 every time. However, like almost all gaming machines, the GS65 still has one big shortfall: mediocre battery life. Yes, its overall longevity has gone up by slightly more than half an hour. But with a total runtime on our battery test of 4 hours and 23 minutes, the GS65’s battery life remains half that of most 13-inch systems. It’s good thing MSI slimmed down the power brick right? Still, for this kind of horsepower, the tradeoff isn’t entirely unreasonable. There’s even enough ports and horsepower to easily hook up a VR headset if you want. And really, that’s kind of the whole point of the GS65 in the first place. It’s not especially blingy, but it’s definitely not ugly either, and when you need performance for work or play, this this baby’s got it where it counts. In a world where there are more gamers over the age of 18 than there are under, it’s nice having a machine that doesn’t feel like it was designed for children. It’s the kind of system you can use at work or game on at home, and it feels right at home in both situations, all without losing it’s own sense sophisticated, but understated identity. I know $2000 ain’t cheap, but unlike so many other gaming systems from Alienware, Acer, HP and others, the GS65 feels balanced, which for a lot of people, is something you don’t appreciate until you get older. And when compared to its closest rival, the 14-inch Razer Blade, the GS65 offers a newer CPU a beefier GPU, and a bigger display with a higher refresh rate—all for less than a similarly specced Blade from Razer. Go ahead and treat yourself. The GS65 fits even better in a bag now too. The black and gold paint job is a subtle but still stylish way to hide your power level. The GS65 still has an RGB keyboard developed in partnership with Steelseries, but the lighting isn’t as bright or obnoxious to better suit adults. Touchpad feels a bit stiff, meanwhile, some panels and the hinge have a worrying amount of flex. One of the first systems available sporting Intel’s new six-core Coffee Lake CPUs. Battery life is fine for a gaming laptop, but you’re really only looking at about 4 to 5 hours of real usage before it dies, or less if you’re gaming.